Suppose for a second that you thought the Sustainable Development Goals were a bad idea. Suppose for a second that you thought that the Sustainable Development Goals (SDGs) were a bad idea, what would you put in their place? It’s a difficult question to answer, but I’ll try. First, let’s unpack the question a little. Tragically, that’s not what happened. More fool us. Instead of one goal to rule them all, one goal to bind them, we got seventeen goals, sixteen of which distract attention from the goal that really should be driving all the others. Perhaps if we’d been offered a genuine choice about what we wanted the future of development to look like, we might have chosen to focus entirely on keeping the planet within two degrees of warming, but we weren’t. Yes, yes, I know what you’re thinking, but you’re wrong, we weren’t given that choice. I don’t know about you, but when it comes to the SDGs the detail troubles me almost as much as the priorities. Consider SDG 1: No poverty, or to give the goal it’s full description: “End poverty in all its forms everywhere”. It’s obvious why this goal is flawed: no-one can live on $1.8 a day and enjoy a full life. So, even if you believe – and it is important to understand that poverty data requires faith – that progress towards achieving SDG 1 is being made, you must still acknowledge that you are progressing towards very little. The point is that even if SDG 1 were achieved and no-one lived below $1.8 a day, all those people living on $1.9, $2, $2.1, $2.2, etc. dollars a day would still be poor. The idea that, by 2030, we will have eliminated poverty is – on this measure – simply absurd. The question to ask is: what does being poor mean? Is poverty not being able to afford an abstract ‘basket of goods’, which is essentially how the World Bank understands poverty. Or is poverty not being able to afford those necessities that enable one to ‘be and do’ – a diet with sufficient calories to get you through the day, for example? This is a perennial question. Over a decade ago, Sanjay Reddy argued that the World Bank’s poverty line (then $1 per day) “fails to correspond to the level of purchasing power required to attain basic human requirements”. Reddy made the case for a capability approach to poverty assessment as an alternative to the World Bank’s purchasing power parity (PPP) approach, with the goal being an “income sufficient to enable an individual to consume a diet that contains enough calories and nutrients”. Even with a physician at its helm, the World Bank shows no sign of revisiting its methodology any time soon. Disconnect yourself from Bank-think for a moment and consider poverty ethically. In that frame of mind, you may be more amenable to Peter Edward’s ‘ethical poverty line’ (EPL). Were one to apply Edward’s ideas and calculate an EPL in today’s money, you’d be looking at $7.4 a day, which is quite a lot more than $1.8. But this is a criticism of the ambition of mainstream international development, and the inadequate methods of measuring poverty that underpin it, rather than a criticism of the system itself. As any vintner will tell you, you don’t put new wine in old bottles; the old bottles must be sterilized first. So it is with international development: there is no point replacing the SDGs with something else unless you are first prepared to clean up the system of doing development. And there are very good reasons for wanting to do that. The first development book I ever read – Susan George’s The Debt Boomerang – left me disoriented. Poor countries paying back their creditors $6.5bn every month in interest repayments alone? Surely some mistake? My book of 2017 – Jason Hickel’s The Divide – had a similar effect. Written a quarter of a century after The Debt Boomerang, the message is depressingly worse: in 2013 developing countries paid total debt service payments of $732bn. But $732bn isn’t even the half of it: Hickel adds $500bn of repatriated profits from investment, $60bn in payments to foreign owners of patents, $973bn in leakages in balance of payments, and $875bn in ‘trade mis-invoicing’ to the money flowing from poor countries to wealthy countries. Add it all up and, in total, $2 trillion flows into poor countries from wealthy countries and $5 trillion flows back out again (Hickel 2017, pp25-27). How much of that $2trillion is development assistance? In 2016, that totaled $126bn, $37.6bn of which was development assistance for health (DAH). To call $37.6bn ‘peanuts’ is an insult to peanuts, quite frankly. And yet we get ourselves into such a flap trying to track where it all goes. You’ll recall the hoo-ha that followed Chunling Lu’s analysis of public financing of health in developing countries, an analysis that found “that for every US$1 of DAH to government, government health expenditures from domestic resources were reduced by $0.43 (p=0) to $1.14 (p=0)”. One hypothesis was that “governments compensate for exceptional international generosity to the health sector by reallocating government funding to other sectors” (emphasis added). My point is not to ridicule the authors for their use of the word ‘generosity’; my point is simply to ask whether, when so much money returns to international donor countries from poor countries every year, does it really matter whether, for every $1 of DAH received, those countries spend 50c less on their health systems? This really isn’t the problem we should be worrying about. Many of the objections I have with the SDGs, including debt cancellation, were summarized in 2015 by the Civil Society Organization Share The World’s Resources (STWR). In its list of “core civil society objections to the SDGs” it included: international aid commitments, differentiated responsibility, tax justice, corporate influence, and inequality as structural impediments to ‘development’. Differentiated responsibility goes to the heart of the matter i.e. placing responsibility for raising additional finances domestically while completely ignoring “historical injustices and structural inequalities”, which includes our current international trade and finance arrangements. Let’s return to the original question: with what should we replace the SDGs? I’m tempted to say ‘nothing’, and in previous drafts of this post that’s what I wrote: nothing. Unless you are prepared to address the structural constraints of the international development system, there’s little point in replacing one set of development goals with another. The system will continue to give and then take back, with interest. Replacing the MDGs with the SDGs will do nothing – nothing – to end poverty. I can absolutely guarantee that in 2030, there will still be poverty in the world. If you believe otherwise, you are delusional. That aside, we could have taken a leaf out of William Easterly’s book The White Man’s Burden, and directed aid towards piecemeal interventions that ‘work’ – searching rather than planning, to use Easterly’s terms. But that was never presented as an option during the SDG consultation period. Had there been any political appetite to change the international development system, then we could have reworked a number of alt-dev objectives into genuinely sustainable development goals. Drawing on ideas expressed by STWR, Chapter 8 of Hickel’s book (titled ‘closing the divide’) lists debt resistance, democratizing international financial institutions, fair trade, just wages and reclaiming the commons as sensible strategies. I would like to see these feature in an internationally agreed set of development goals. But this is all hypothetical. There is very little political appetite to change the international development system. The ideas listed above lie at the margins of development thinking and require a groundswell of support to gain traction in the mainstream. But that does not mean you have to do nothing. What you can do, right now, is decide not to accept as authoritative the World Bank’s definition or method of measuring poverty. Whenever you discuss poverty with anyone, don’t just parrot the poverty data presented to you through the UN system. 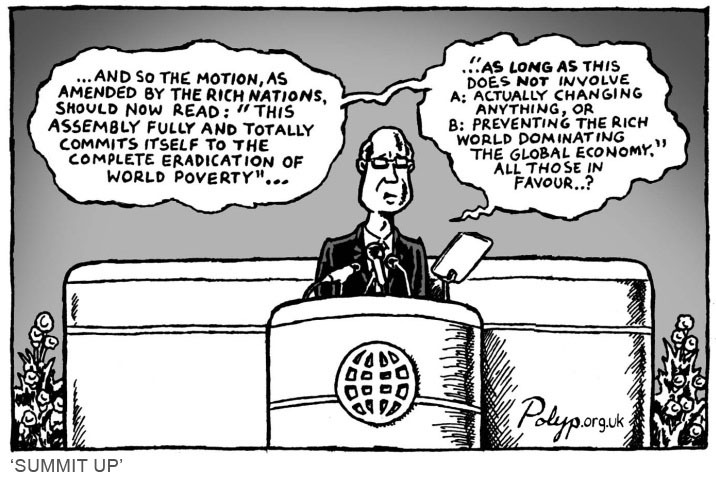 In any discussion, at any meeting, and during any debate, set the terms of the poverty debate as though $7.4 per day were the goal. Do that, and you reclaim poverty from those who would seek to perpetuate it. You will also find yourself disagreeing with pretty much everyone, all the time, about everything – which is no bad thing. You have a choice. You can uncritically accept the poverty data on which SDG1 rests and convince yourself that the lives of the global poor will improve over the next 12 years. Or, you can recognise that there are structural impediments built into the system of international development; structures that will ensure that ‘rich countries stay rich, and poor countries stay poor’. You can get off the SDG train, if you want to. It is not a mandatory ride and it’s heading in the wrong direction, so you’d be wise to get off. You can’t have economic growth of the order of magnitude envisaged by the SDGs underpinning a sustainable development agenda. It is rationally, logically, ethically, morally, and existentially unsustainable. Finally, set your own terms, choose your own data, and establish your own goals. Read up on degrowth and help shape some of the exciting ideas for genuine social development that that movement is working with.